David Wachler, born in 1900, started his Jewelry business in downtown Detroit, Michigan in 1922 when he moved to this country from Germany. Originally, Wachler manufactured custom designed jewelry, sold his jewelry and diamonds directly to the jewelry trade. In 1950, David Wachler & Sons opened a store in northwest Detroit, changing from a company, which catered to the wholesale trade, into one which sold directly to the public. Today, David’s grandson, Buzz and his daughter, Lori, continue the tradition of having 4 generations of Wachlers working at the store. 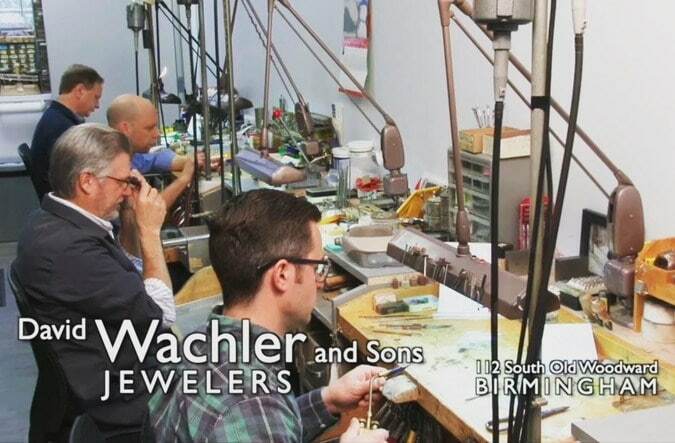 Located in the heart of downtown Birmingham, Michigan, David Wachler & Sons continues to be a staple in the jewelry industry throughout the metropolitan Detroit area. Buzz Wachler is a jewelry designer/manufacturer by trade, is also a Certified Gemologist and President/CEO of David Wachler & Sons. Dennis Tarockoff has been with the company for over 35 years, and is a Graduate Gemologist from the Gemological Institute of America. There are four full time bench Jewelers/Designers, including another father and son team as well. They have all been with the company for many years. David Wachler & Sons designs and manufacturers Jewelry in its own shop. From the initial hand carved wax, the casting, the metal finish work to the stone and diamond setting, the entire process is done in-house. Over the years, David Wachler & Sons has won more than 30 National and International Jewelry design awards, including the prestigious Diamonds International Award which is very rare for an American Jeweler. Two of the national design awards were won by Buzz and his father Norman, in the same year, which is quite an accomplishment for a family owned business. The company has also been voted Detroit’s Best Custom Jeweler by HOUR Detroit magazine several times. Members of the David Wachler and Son's team that are always available to help. Sales, Jewelry Designer/manufacturer by trade. A Certified Gemologist and President/CEO of David Wachler & Sons. Sales, Appraiser, Estate Buyer. A Graduate Gemologist from the Gemological Institute of America.